Why Did the Neo-Nazis in Charlottesville Chant “Blood and Soil”? Yoni Anijar is a graduate of the University of Florida and The George Washington University Law School. Yoni is a Features Editor for the History News Network. 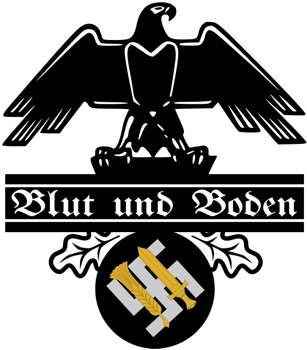 Recent events in Charlottesville have revived many old racial tropes and anti-Semitic slogans, most notable of which was “blood and soil” (German: blut und boden), an unfamiliar phrase to those without an interest in 19th and 20th century German political history. The phrase first came into popular use in Germany in the late 19th century by German nationalists as a populist slogan meant to emphasize the racial purity of the German people (blood) and their connection to a German homeland (soil). There is more to it though; the slogan was meant to evoke romantic notions of the ideal German as both racially pure and intimately tied to the land, a sort of agrarian puritanism. Two pronged, its use was meant to both mythologize the rural country German and to deemphasize the role of the urban elite in German society. Furthermore, the construction of the phrase; binary, monosyllabic and deathly simply also had the effect of being a primal galvanizing call to all Germans. Richard Walther Darré, a prominent Nazi official and eugenics thinker, is largely credited with popularizing the Blood and Soil movement in early 20th century that specifically aimed to resettle German citizens from the city to the countryside, believing that there was a strong mutual relationship between the people (specifically Germans) and the land (Germany). This ideology placed a premium on the peasant life, and asserted that the purest Nordic blood coursed through the veins of German country farmers. In other words, the term implied that the peasantry represented German ethnicity in its most authentic form. As such, the primary objective of the Blood and Soil ideology was to ensure the preservation of pure German bloodlines and use the military as a tool to defend the land so inextricably linked to those bloodlines. The Blood and Soil movement was founded on an ethno-nationalist ideology that later formed much of the philosophical basis for future Nazi policies. According to Gerhard Weinberg, Professor Emeritus of History at the University of North Carolina at Chapel Hill and an expert on Nazi history, the phrase implied an extreme nationalism. Today the phrase has caught a foothold among both white nationalists and Neo-Nazis and has been used as a rallying cry to highlight the concern, as they see it, that the United States is moving away from its traditional values and adopting those of the immigrants who have gradually populated the country over the last half century. The use of “blood and soil” by white nationalists could also be meant to draw a parallel between the ethnic ideal of the German rural class and their ethnic ideal of a white American working class. In Charlottesville, with a confederate statue at the center of the rally, chanting “blood and soil” was a clear public declaration of the protestors’ support for white supremacy as well as white racial protectionism.